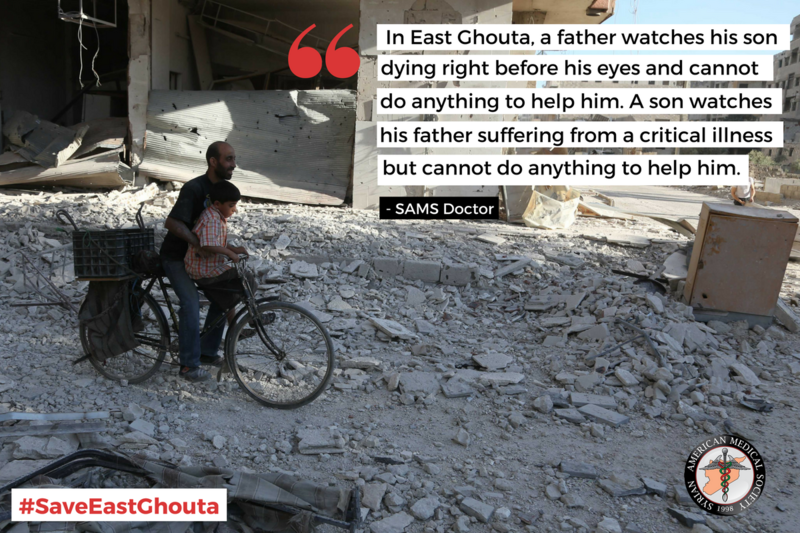 “Many patients are simply awaiting their death at home,” said SAMS doctor in East Ghouta. Nearly 400,000 civilians living in besieged East Ghouta are facing severe shortages of basic goods and lifesaving medical care. In its latest brief, Under Siege: The Plight of East Ghouta, SAMS highlights the devastating impact of the four-year long blockade on the health sector and underscores the pressing need to break the siege. Only 107 doctors, including one oncologist and one neurosurgeon, remain to treat the nearly 400,000 residents of East Ghouta. These physicians, in many circumstances, are not able to provide much more than a diagnosis due to the severe shortages of medications and surgical supplies. Contagious diseases including salmonella, measles and tuberculosis, have spread. 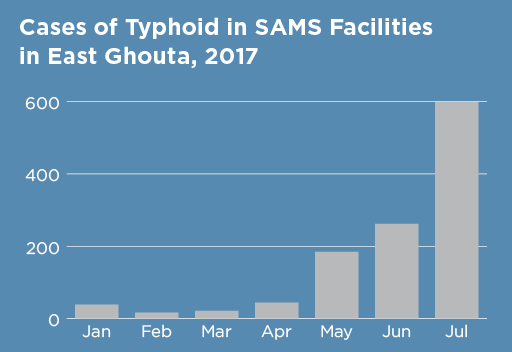 In July 2017, SAMS medical staff reported nearly 600 cases of typhoid in the besieged area. The brief also details the ongoing difficulties in securing approval for medical evacuations of critical cases. In August 2017, four children died in East Ghouta waiting for permission to be evacuated. On September 23, 2017, five year old Osama lost his life due to acute herpetic encephalitis. Acyclovir, the antiviral medication needed to save his life, was available just kilometers away in Damascus. A list of 330 patients has been shared with health actors in Damascus for evacuation, to no avail. Under Siege: The Plight of East Ghouta highlights the effects of the “surrender or starve” tactic that is utilized in at least 34 besieged communities across Syria. Immediate steps must be taken to end the siege in East Ghouta and all other besieged areas in Syria.